A six sided gazebo with multiple infill panel combinations. 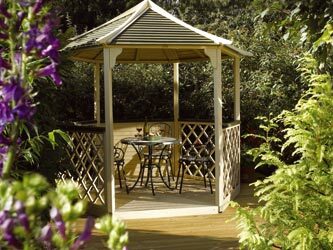 The Gainsborough is supplied as a complete kit comprised of one solid full height and two solid half height infill panels as well as four half trellis panels providing numerous assembly options. Pressure treated natural timber finish. Supplied flat packed with easy to assemble instructions.